Your organization, as a Member-Owner, has the right and responsibility to appoint a delegate to represent your organization at member meetings. This individual should have a clear understanding of the position your organization would have on issues pertaining to you and your sector. A delegate and alternate (if necessary) must be appointed ahead of each Annual General Meeting, using the Delegate and Alternate Form. 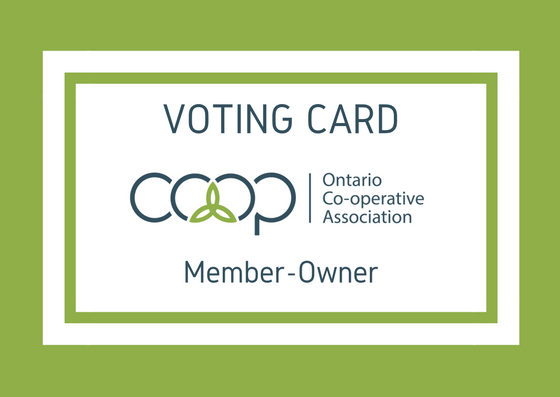 A good choice for a delegate is someone who is engaged with their own organization’s decision-making, and has an interest and understanding of the Ontario Co-operative Association's mission, vision and values. To qualify as a delegate, the individual must be a director, officer or member of a Member-Owner in good standing of the Ontario Co-operative Association and has been approved by such organization with completion of the Delegate and Alternate Form. If your organization needs support on choosing your delegate, or training your delegate on the types of decisions and discussions that come up at a member meeting, let us know and we will be happy to provide an overview.